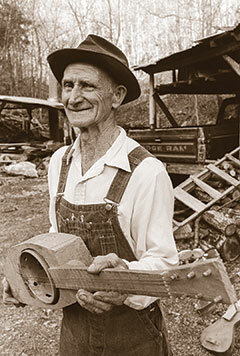 Preacher, farmer, singer of hymns, Ozarks native and maker of folk art musical instruments. Each of these terms describes Ed Stilley. 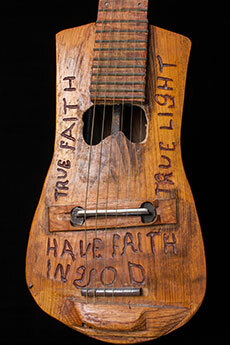 Although he has made his mark in his small Carroll County community with his strong faith and work ethic, it is his unique folk art musical instruments that have made him the subject of a new book, “True Faith, True Light: The Devotional Art of Ed Stilley,” written by Kelly Mulhollan and published by the University of Arkansas Press. The book documents about 50 of the more than 200 musical instruments that Ed built over a period of 25 years. “Isolated from the modern world and conveniences most of us take for granted, Ed Stilley has lived his life as if the second half of the 20th Century never happened,” Mulhollan writes in the book. “His creative process, his craftsmanship, and the instruments themselves speak to us of a time and a way of life that’s almost gone, except in memory. 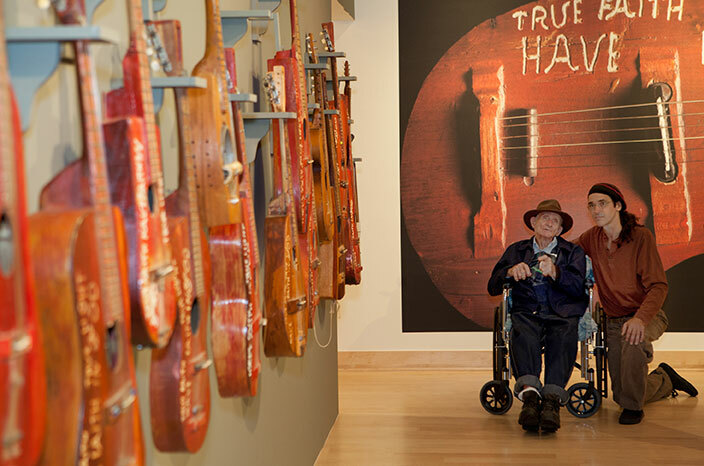 Maybe Ed’s work resonates so deeply because we know it represents something precious that won’t come again.” With Mulhollan’s support and help, this inspiring story is now reaching people far from the Ozark hills. Eliza and Ed Stilley, at their home in Hogscald Hollow. Ed was born in 1930 in the home of his paternal grandparents, Mandy and Jordan Stilley, in a tiny community known as Hogscald Hollow, or “Holler” as the locals say. He was one of six children — four boys and two girls. When he was 11 years old, he moved in with “Aunt” Fannie Prickett, who lived nearby. Raised in a religious home, Ed says he was called to preach at age 19. While sermonizing at Freewill Baptist Church in Clifty, he met Eliza Miller. In 1959, they married and moved in with Fannie for a year and a half. During this time, Ed built their home across the way from Fannie’s. He continued to preach and, from time to time, he baptized folks in springs of Hogscald Holler. 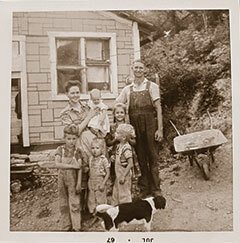 But he could not rely on preaching to feed a growing family — the Stilleys had five children; three boys and two girls. Family snapshot, dated July 1967, in front of the Stilley home. “I raised corn, and then we had a big garden and hay,” he said, adding that they had a total of 80 acres of land. He farmed the old-fashioned way, with horses and a plough. They planted green beans, tomatoes, peppers, potatoes and squash. 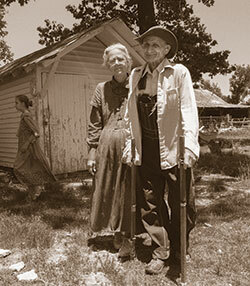 They took their harvest to the nearby town of Eureka Springs to sell to locals and make money to support the family. They also grew and sold strawberries, as well as hay. Ed built a barn and shop buildings. They raised chickens and cows. They also grew cane, and then made and sold their own sorghum molasses. For some years, Ed also worked in a nearby sawmill to make a living. The water from the creek was hauled into the home until a system was devised to pipe the springs to a “water box” and then into the house. Around 1962, the Stilleys got electricity. (They are members of Carroll Electric Cooperative.) They lived in this home until 2005 when they moved a few miles away to a more modern house where they would be closer to family. Eliza has a vegetable garden, chickens and a few cats running around. Ed has slowed down a lot. 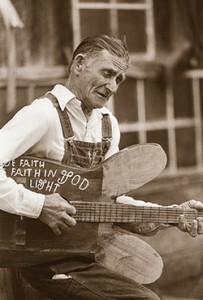 But when he’s feeling up to it, he will still sing a gospel song, share scripture or play his harmonica. On Sundays, the couple often attends church services in Berryville. During a recent interview, Ed shared his favorite Bible verse; his mantra for living: “Trust in the Lord with all thine heart; and lean not unto thine own understanding. In all thy ways acknowledge him, and he shall direct thy paths.” (Proverbs 3:5-6, King James Version). While Ed talked, Eliza offered homemade bread from the oven, slathered with butter and sorghum molasses. Ed is 85 today and a bit of celebrity once again, thanks to “True Faith, True Light: The Devotional Art of Ed Stilley,” published in late 2015. The author, Kelly Mulhollan, and his wife, Donna, can claim to be good friends with the Stilleys. After all, they spent almost 20 years getting to know them. They learned about Ed’s life, particularly his mission to make instruments and give them away. The Mulhollans have devoted two decades of their lives to finding Ed’s instruments and documenting this incredible story. When Putthoff wrote and photographed Ed, it was at the urging of his longtime childhood friend, Kelly. Time marched on. In 2013, the Mulhollans curated the first exhibit of Ed’s work for the Walton Arts Center’s Joy Pratt Museum in Fayetteville as part of the Roots Festival. 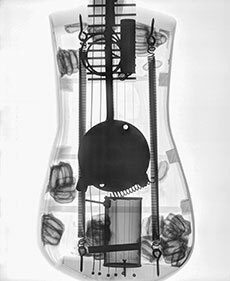 In addition to some 35 Stilley instruments, the exhibit also featured huge X-ray images of Ed’s creations, which revealed the unusual contents inside — not only potlids and springs, but saw blades and shaving cans, among other items. Meanwhile, the Mulhollans had begun working on a book documenting Ed’s work but had difficulty securing a publisher. That all changed when Russell Cothern, another avid photographer and fan of Stilley, urged a well-known professor and folklorist, Robert Cochran, Ph. D., to attend the exhibition. The turning point had come and the book became a reality. Another large-scale exhibit of Ed’s work is planed for this fall at the Old State House Museum in Little Rock. Photographer Kirk Lanier worked alongside the Mulhollans and photographed beautiful color images of the instruments. There are also fascinating X-ray images by Dr. Dennis Warren, along with reprints of Putthoff’s photographs, as well as photographs by Cothren and by Mulhollan. It’s no stretch to say that the Stilleys and the Mulhollans are forever joined by this book and the journey they’ve taken together. These days, at least every couple of weeks, the Mulhollans pay a visit to say hello and check in with Ed and Eliza. 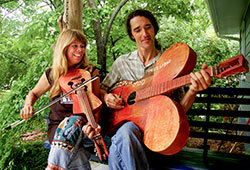 The Mulhollans, who are known professionally as the folk duo Still on the Hill, were each given instruments by Stilley. 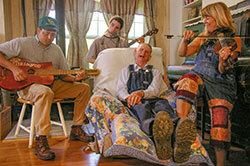 The Mulhollans perform with them at most every concert. To learn more about the book, as well as listen and watch Ed playing, singing and preaching, visit www.stillonthehill.com/edstilley. Amylou Wilson is a Fayetteville-based writer.